Independent cafe in Addiscombe, right next to the tram stop. It's quite small, seating only around 35 people. 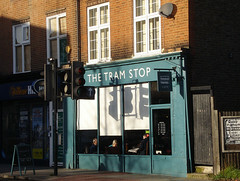 The front is fully glazed, letting in the light and offering a good view of the tram stop opposite. Exposed dark wood floorboards, mismatched upright wooden chairs, brown and white sugar lumps in jars on the tables, and framed vintage railway ads on the walls all give a retro feel. A sideboard holds newspapers and a book swap station; the books are available for reading in the cafe and also for taking away as long as you bring another one back next time (except for the children's books, which are for reading in the cafe only). They have free WiFi (ask staff for the network name and password). The menu partly varies with the seasons, but includes cooked breakfasts, sandwiches, bagels, savoury tarts, salads, and sweet baked goods. Several varieties of coffee and tea (Twinings and Teapigs) are available. They usually have gluten free bread and bagels, and often cakes too. Kake first visited on a Thursday lunchtime in January 2015. There were 8 or 9 other customers in when I arrived around noon, including a toddler, and swing music was playing, not too loud. When Kake visited again on a Monday morning in June 2018, it was about half full at 10am, and no music was playing this time. In January 2015, I chose the focaccia with tuna, olives, red onion, and capers (£5 including leaf salad and crisps) photo from the seasonal menu. The filling was great; the olives and other ingredients were finely chopped and well-amalgamated with the tuna, and there was plenty of it. The focaccia as a whole was a little too big to fit into my mouth comfortably without squeezing some of the filling out, but the crisps provided on the side were a good way to scoop up the escaped tuna. In June 2018, I had one of the breakfast specials: scrambled egg, mushroom, avocado, and pesto with focaccia (£6.45) photo. The mushrooms were a little bland on their own, but fine once combined with the pesto, and they were cooked competently. The eggs were cooked a little more than I liked, and I'd have preferred to have a smaller portion not bulked-out with milk, but this is more of a personal preference than a complaint. The avocado was fine, neither underripe nor overripe. Overall, it all went together pretty well and made a nice change from the usual breakfast offerings. On another visit later in June 2018, I had one of the lunch specials: haggis, bacon, mozzarella, and cranberry sauce ciabatta (£7.45 including leaf salad and crisps) photo. The unusual combination of ingredients worked surprisingly well, and the ciabatta was a decent size which along with the salad and crisps made it feel worth the price. Service was generally efficient and friendly on all my visits. No service charge was added, but there's a thing to put tips in next to the till. Child-friendliness: There are at least two highchairs, the type without trays, and fairly small. They have a separate children's menu including a "Little Tramspotter's Breakfast" and "Little Tramspotter's Lunchbox" as well as other things. A pull-down baby change table and nappy bags are provided in the single unisex toilet. Children's books are available too, for reading in the cafe only. Accessibility: A small step to get in. No steps to the toilet, but access is a bit narrow. Last visited by Kake, June 2018. Opening hours taken from the Tram Stop website, June 2018. Last edited 2019-02-15 13:50:37 (version 10; diff). List all versions. Page last edited 2019-02-15 13:50:37 (version 10).